Chadian Arabic (also known as Shuwa/Shua/Suwa Arabic;[a] Arabic: لهجة تشادية‎, Baggara Arabic, and, most recently, Western Sudanic Arabic) is one of the regional colloquial varieties of Arabic and is the first language for over three million people, both town dwellers and nomadic cattle herders. 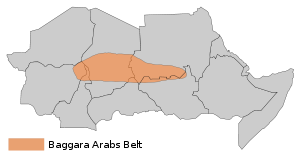 The majority of its speakers live in southern Chad. Its range is an east-to-west oval in the Sahel, about 1400 miles long (12 to 20 degrees east longitude) by 300 miles north-to-south (between 10 and 14 degrees north latitude). Nearly all of this territory is in the two countries of Chad and Sudan. It is also spoken elsewhere in the vicinity of Lake Chad in the countries of Cameroon, Nigeria, Niger. Finally, it is spoken in slivers of the Central African Republic and South Sudan. In addition, this language serves as a lingua franca in much of the region. In most of its range, it is one of several local languages and often not among the major ones. This language does not have a native name shared by all its speakers, beyond "Arabic". It arose as the native language of nomadic cattle herders (baggāra, Standard Arabic baqqāra, means 'cattlemen', from baqar). Since the publication of a grammar of a Nigerian dialect in 1920, this language has become widely cited academically as "Shuwa Arabic"; however, the term "Shuwa" was in use only among non-Arab people in Borno State. Around 2000, the term "Western Sudanic Arabic" was proposed by a specialist in the language, Jonathan Owens. The geographical sense of "Sudanic" invoked by Owens is not the modern country of Sudan, but the Sahel in general, a region dubbed bilad al-sudan, 'the land of the blacks', by Arabs as far back as the medieval era. In the era of British colonialism in Africa, colonial administrators too used "the Sudan" to mean the entire Sahel. During the colonial era, a form of pidgin Arabic known as Turku was used as a lingua franca. There are still Arabic pidgins in Chad today, but since they have not been described, it is not known if they descend from Turku. Although not indicated on the map, the range of Chadian Arabic also includes the sliver of Niger adjacent to Nigeria and Chad. In Sudan, it is spoken in the southwest, in southern Kurdufan and southern Darfur, but excluding the cities of al-Ubayyid and al-Fashir. Its range in other African countries includes a sliver of the Central African Republic, the northern half of its Vakaga Prefecture, which is adjacent to Chad and Sudan; a sliver of South Sudan at its border with Sudan; and the environs of Lake Chad spanning three other countries, namely part of Nigeria's (Borno State), Cameroon's Far North Region, and in the Diffa Department of Niger's Diffa Region. The number of speakers in Niger is estimated to be 150,000 people. In Nigeria, it spoken by 10% of the population of Maiduguri, the capital of Borno, and by at least 100,000 villagers elsewhere in Borno. In 1913, a French colonial administrator in Chad, Henri Carbou, wrote a grammar of the local dialect of the Ouaddaï highlands, a region of eastern Chad on the border with Sudan. In 1920, a British colonial administrator in Nigeria, Gordon James Lethem, wrote a grammar of the Borno dialect, in which he noted that the same language was spoken in Kanem (in western Chad) and Ouaddaï (in eastern Chad). It is characterized by the loss of the pharyngeals [ħ] and [ʕ], the interdental fricatives [ð], [θ] and [ðˤ], and diphthongs. But it also has /lˤ/, /rˤ/ and /mˤ/ as extra phonemic emphatics. Some examples of minimal pairs for such emphatics are /ɡallab/ "he galloped", /ɡalˤlˤab/ "he got angry"; /karra/ "he tore", /karˤrˤa/ "he dragged"; /amm/ "uncle", /amˤmˤ/ "mother". In addition, Nigerian Arabic has the feature of inserting an /a/ after gutturals (ʔ,h,x,q). Another notable feature is the change of Standard Arabic Form V from tafaʕʕal(a) to alfaʕʕal; for example, the word taʔallam(a) becomes alʔallam. The first person singular of verbs is different from its formation in other Arabic dialects in that it does not have a final t. Thus, the first person singular of the verb katab is katáb, with stress on the second syllable of the word, whereas the third-person singular is kátab, with stress on the first syllable. The two meanings of īd stem from formerly different words: *ʔīd "hand" < Classical yad vs. *ʕīd "festival" < Classical ʕīd. In Classical Arabic, chicken (singular) is dajaja, and collectively dajaj. ^ The term "Shuwa Arabic", found in 20th-century Western linguistic scholarship, properly refers only to the Nigerian dialects of this particular language, and even then, "Shuwa" is not used by those speakers themselves. ^ Hammarström, Harald; Forkel, Robert; Haspelmath, Martin, eds. (2017). "Chadian Arabic". Glottolog 3.0. Jena, Germany: Max Planck Institute for the Science of Human History. ^ a b Watson 1996, p. 359. ^ Hammarström, Harald; Forkel, Robert; Haspelmath, Martin, eds. (2017). "Turku". Glottolog 3.0. Jena, Germany: Max Planck Institute for the Science of Human History. ^ Pommerol 1997, pp. 5, 8. ^ Pommerol 1999, p. 7. ^ Kaye 1993, p. 95. ^ a b c d Owens 2006. Carbou, Henri. 1954 . Méthode pratique pour l'étude de l'arabe parlé au Ouaday et à l'est du Tchad. [Practical method for studying the Arabic spoken in Waddai and the east of Chad]. Paris: Librairie orientaliste Geuthner. This Web page has a link to the full text. This 1954 printing contains the 1913 edition, including the original title page. Fox, Andrew (October 1988). "Nigerian Arabic–English Dictionary by Alan S. Kaye, Book Review". Language. Language, Vol. 64, No. 4. 64 (4): 836. doi:10.2307/414603. JSTOR 414603. Kaye, Alan S. 1976. Chadian And Sudanese Arabic In The Light Of Comparative Arabic Dialectology. Mouton. Owens, Jonathan (2007). "Close Encounters of a Different Kind: Two types of insertion in Nigerian Arabic code switching". In Miller, Catherine G. (ed.). Arabic in the city: issues in dialect contact and language variation. London: Routledge. ISBN 0-415-77311-3. Owens, Jonathan. 2003. Arabic dialect history and historical linguistic mythology. Journal of the American Oriental Society. Owens, Jonathan. 2006. A Linguistic History of Arabic. Oxford University Press. Pommerol, Patrice Jullien de. 1997. L'arabe tchadien: émergence d'une langue véhiculaire. Karthala. 174 pp. Pommerol, Patrice Jullien de. 1999. Grammaire pratique de l'arabe tchadien. Karthala. 280 pp. N'Djamena dialect. Watson, JCE. 1996. [Review of Owens 1994] . Bulletin of Oriental and African Studies, 59: 359-360. Howard, Charles G. 1921. Shuwa Arabic Stories with an Introduction and Vocabulary Oxford: University Press, 1921, 114 pp. Kaye, Alan S. 1982. Dictionary of Nigerian Arabic. Malibu: Undena. Series: Bibliotheca Afroasiatica; 1. This volume is English-Arabic. 90 pp. Kaye, Alan S. 1987. Nigerian Arabic-English dictionary. Malibu: Undena. Series: Bibliotheca Afroasiatica; 2. 90 pp. Owens, Jonathan. 1993. A grammar of Nigerian Arabic. Wiesbaden: Otto Harrassowitz. Owens, Jonathan, ed. 1994. Arabs and Arabic in the Lake Chad Region. Rüdiger Köppe Verlag. Series: SUGIA (Sprache und Geschichte in Afrika); 14. Pommerol, Patrice Jullien de. 1999. J'apprends l'arabe tchadien. Karthala. 328 pp. N'Djamena dialect.